Choosing the right combination of oils in your soap bar recipe is very important, they all provide different qualities to your bar of soap. You need some that provide hardness as you don’t want your soap bar to turn to mush as soon as it gets wet. Then depending upon the purpose of your soap you need to put in oils that provide cleansing power. Shampoo bars need to be quite powerful cleansers to remove oils from the hair, but facial soap needs to be very mild to protect the delicate skin of your face. You also want to add oils which will moisturise the skin, leaving it feeling soft and comfortable after cleansing. The qualities of soaping oils depend upon the fatty acids they contain, each different oil has a completely different profile of fatty acids. There is a wonderful table on the SoapCalc website highlighting the different fatty acids and showing which qualities they will bring to your soap. If you are having a problem with a recipe and you want to increase any of the properties listed in the table, then look at which fatty acids will provide these qualities in your soap bar. For example if I wanted to increase the cleansing values of my bar I would need to add lauric or myristic acid. SoapCalc also has another really useful page which then tells you which soaping oils contain the highest percentages of these fatty acids. To find oils high in lauric acid, click the lauric acid button and it will sort the oils in order of % lauric acid content. Common oils like palm kernel oil and coconut oil come high on this list with 49 and 48% lauric acid. Therefore these are the oils I would look to add to my bar to increase cleansing. I hope this explanation is useful, If you have any questions then feel free to drop me a comment and I will do my best to help. This produces a wonderful smelling soap and the pastel colours compliment the fragrance beautifully. The goat’s milk yoghurt produces a lovely bubbly bar of soap and the silk adds extra smoothness. You can leave out the soap and the colouring if you don’t have those ingredients available to you. Prepare your mold, either line it with waxed paper or petroleum jelly to help release the soap when it has hardened. Use plastic or cardboard sheets to make 4 divisions in your mold, I am lucky and my mold comes with acrylic sheets that slot into place. Now you are ready to start soaping. Heat the oils until melted, mix the sodium hydroxide and water together. Wait until the two portions cool down to 35C then mix the two parts together. Blend with a stick blender until the mixture reaches light trace. Add the titanium dioxide and yoghurt to the whole batch and mix thoroughly. (You will have to work fast from now on as the sugars in the goats milk will heat up the batter and you don’t want brown soap!) 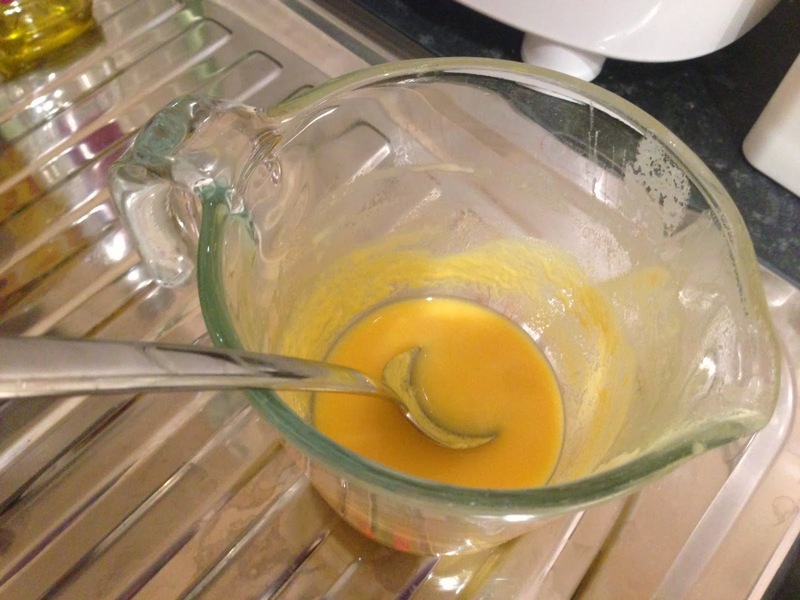 Separate the batter into three containers, two with 1/4 batter in each and one with the remaining 1/2 of the batter. Add the green and blue mica to the two 1/4 batch containers. Fill up two of the mold sections with white mix and the other two with the coloured batter. Then gently remove the separating sheets. You should now have a mold filled with 4 stripes of differently coloured soap. Take a stainless steel skewer or piece of wire coat hanger and swirl it through the soap in a figure of eight pattern wich will produce a mantra swirl pattern on the top of your soap. Quickly move your mold into the fridge to make sure the soap doesn’t overheat, and leave overnight to saponify. I took my soap out of the fridge the following morning but the soap was still too soft to unmold and cut so it needed to be left another two days to dry out before it was hard enough to cut. I thought this was going to be a failure half way through but it all turned out ok in the end, I don’t seem to have much luck with fragrance oils. Every one I have tried so far has caused my soap to set up really quickly. I’d love to hear about other people’s experiences with this. I fancied something that was a bit indulgent for my shower. I had recently purchased some sweet fragrance oils so I thought I would have a go at a chocolate soap with added cocoa butter and cocoa powder. I didn’t want the soap to have horrible brown lather so I am only used a small amount of cocoa powder and make the colour look a bit darker with some chestnut coloured mica. Slowly mix the sodium hydroxide with the water until it has dissolved completely and set aside. 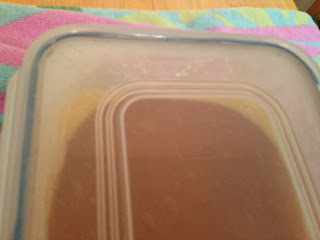 Melt the oils over a gentle heat until they have dissolved completely then add the cocoa powder and mica. 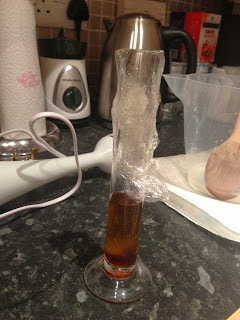 Wait for both parts to cool to 40C, add the fragrance oils to the other dissolved oils and then combine with the sodium hydroxide. Mix with a hand blender until the mixture thickens. My fragrance oils caused my mixture to trace really really quickly, it only took a couple of bursts and my mixture had begun to set!!! I quickly plopped it into the mold and hoped for the best. After about half an hour the surface of the soap started to form tiny beads of liquid and the soap started to really heat up in the mold. After doing some research it appears that the soap may have got too hot due to the fragrance oil speeding up the chemical reaction so much. I put it in the fridge to cool it down a bit. I unmolded the soap the next day and it is fine, no separation and it smells lovely. A kind of chocolatey amaretto smell, almost good enough to eat. How to deal with a curdled disaster! Unfortunately I forgot to take any photos while making this so the post is going to look a bit boring. This soap started out as a disaster for me but I managed to remedy the situation and ended up with a really nice bar of soap in the end. I have outlined below what went wrong, how I remedied it and what to do to prevent this happening to you. This soap contains lots of really rich oils to provide lots of moisture for sensitive facial skin, along with kaolin clay to cleanse and gently exfoliate dead skin cells. Please read the health and safety instructions, and the whole post before attempting this recipe. Place the water into a plastic container and slowly add the sodium hydroxide bit by bit until it has completely dissolved. Gently heat the oils in a pan until they have completely dissolved. 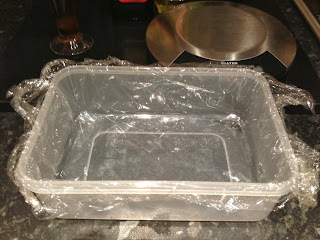 Wait until both the lye mixture and the oils have cooled to 45C then combine them in a plastic container. Blend the two together until the soap mixture reaches trace. Add in the kaolin, mica (you may want to add more than 1tsp, I wanted a really pale shade of pink for my soap so this is why I used such a small amount). I spooned it into the mold in one big glob and hoped that the soap would sort itself out when it reached gel phase. The next morning I checked on it and it was still an oily mess. My plan was to heat it up in a pan to rebatch it but I know you can’t make soap in an aluminium pan so I tried all the pans we have with a magnet to find a steel one and no luck! As a last resort, I set our big soup pan on the stove and filled it with boiling water. I spooned the dodgy soap mix into a zip lock plastic bag and the put another bag around it to keep out the water. I boiled the soap mixture in the bag until it had completely melted, at this point the soap turned from a curdled mess into a nice smooth soap mix which I squeezed out of the bag back into the mold and allowed to set. I left the soap for two weeks to dry out, then it was ready to use. I’m really pleased with it as it moisturises my dry facial skin really well and has a lovely light smell of roses. I have done some research and there are several things you can do to prevent the soap seizing so badly when you add certain fragrance oils. I will give these methods a go next time I work with fragrance oil. 1. Add your fragrance oil to the melted oils before adding the sodium hydroxide as the effects of the fragrance oil will be diluted by the other oils. 2. Mix the oil and sodium hydroxide together at a lower temperature to prevent the mixture reaching trace as quickly. 3. Make your soap base with a higher amount of liquid oils as this will also slow down trace. This is designed to be used in the kitchen, the coffee grounds are great at absorbing odours and the rosemary and patchouli essential oils give it a wonderful smell that appeals to both men and women. This soap smells amazing and the exfoliating coffee grounds are great for removing stubborn dirt. My husband used this soap after boxing with some really stinky gloves on. Usually the smell won’t go away even if you wash your hands several times with regular hand soap, but his hands were left smelling great after just one wash. He also liked the smell as it isn’t feminine at all. Please read the safety information and make sure you are confident in handling sodium hydroxide before you attempt this recipe. Start by weighting out all of your ingredients so they are ready when you need them. Slowly mix the brewed coffee with the sodium hydroxide little by little until it is completely dissolved and set aside to cool. Heat the oils on a low heat until they have completely dissolved, once more set aside to cool. When the sodium hydroxide mixture and the oils have both cooled to 35C you can mix them together. This may require cooling one of them at a faster rate in cold water to get them to the same temperature. Mix with a hand blender until the mixture thickens and reaches ‘trace’. This is the stage where you can see a mark left behind on the surface for a couple of seconds after you have removed the blender. My mixture reached trace after about six minutes of blending. You can see from the picture what this should look like. Now add the essential oils and coffee grounds and blend for a few seconds to make sure everything is mixed thoroughly. 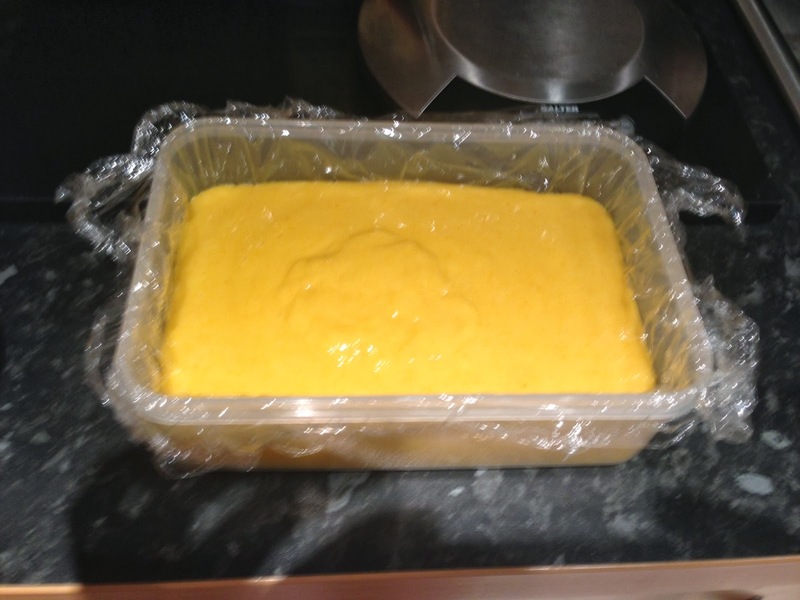 Pour the mixture into your mold, I used a plastic box lined with cling film to help release the soap. Cover and insulate to keep heat in while the chemical reaction is occurring. Leave for at least 15 hours before removing from the mold and slicing into pieces. Leave in a cool dry place to cure for six weeks. 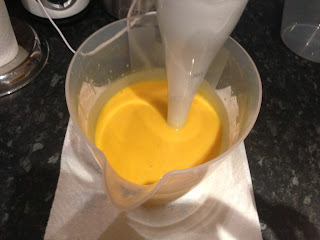 I’m being brave and attempting an orange scented soap, I’m going to add milk powder to add extra creaminess hence the name ‘orange smoothie’. I know that it is hard to get citrus scents to stay in soap and have no idea how successful this will be but I’ve done some research and adding certain complimentary essential oils is supposed to help the scent hold. That’s why I have included patchouli, bergamot and lemongrass to the mix. Also adding fresh zest is another method of trying to help the scent to hold. This soap turned out really well, it was nice and hard so it works really well as a shower soap as it doesn’t dissolve in your hands. It has just the right combination of cleansing and moisturising properties for washing your body. The smell is wonderful and has not faded much after curing, the smell really fills the shower cubicle in a morning and it is a great scent to wake up to. Be sure to read the heath and safety section before attempting to make soap with sodium hydroxide. It is extremely caustic and can cause serious injury if handled incorrectly. Carefully weigh out the sodium hydroxide and the distilled water in two separate containers. Slowly add the sodium hydroxide bit by bit until it is completely dissolved, stirring with a wooden or plastic spoon. Set aside to cool as it will get quite warm. You can barely see it in the bottom of the jug there is such a small amount. Melt the oils together over a low heat and also set aside to cool. 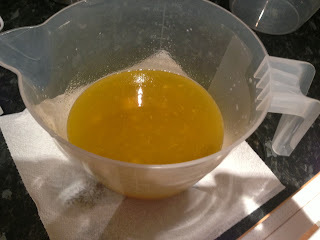 I also added the orange zest at this point as I wanted the mixture to be as smooth as possible, you can add it when you reach trace if you prefer larger chunks of zest in the soap bars. 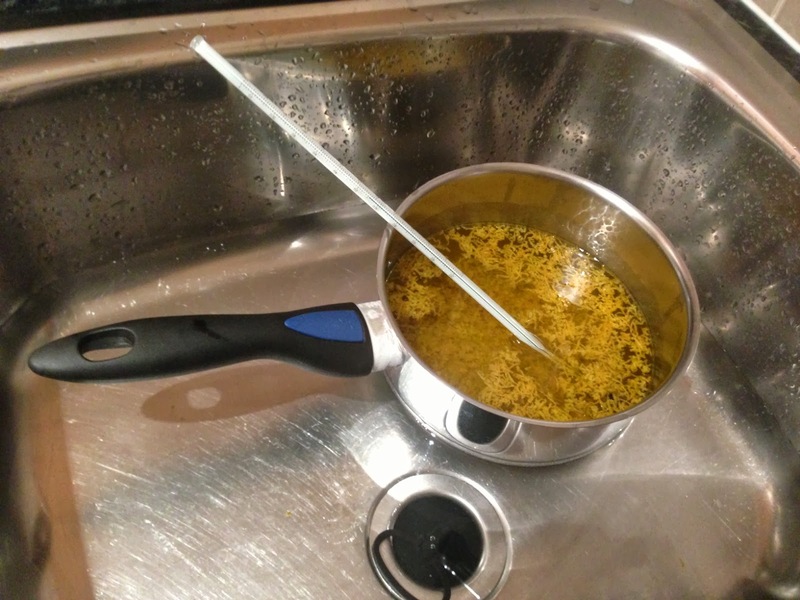 Heat up the remaining 90g distilled water and add the strands of saffron, mix until the liquid is a nice shade of yellow then strain out the saffron through a sieve. Add the milk powder to the yellow water and stir until mixed. At this point I also measure out my essential oils into a glass container, large volumes can take a long time to get out of the bottles drop by drop so I make sure I have everything ready in one place to pour straight into the soap, this will avoid it setting too quickly before getting it into the mold. I then cover the glass container with cling film to keep the strong smell at bay. Wait until both the sodium hydroxide and oils have cooled to around 35C. You may have to use a bit of cold water in the sink to get one or the other to cool at a faster rate so they both reach the same temperature at the same time. Combine the oils, sodium hydroxide mix and the milk powder mix. Start to blend with a hand blender and the oil and water will emulsify and go a creamy colour. The mixture will quickly heat up due to the sugars in the milk, keep blending and eventually the mixture will start to thicken. I blended for just over 10 minutes before the mixture reached trace. When you pull the blender out the mixture should be thick enough that the drips are visible on the surface of the mixture for a few seconds before disappearing, this is trace. (I couldn’t get a good picture of this unfortunately) You must reach this point before putting your mixture into a mold. If you do it too soon then the sodium hydroxide and oils are not sufficiently mixed and your soap will not set properly. At this point I added my essential oils and blended for a few more seconds to make sure the oils were mixed in thoroughly. 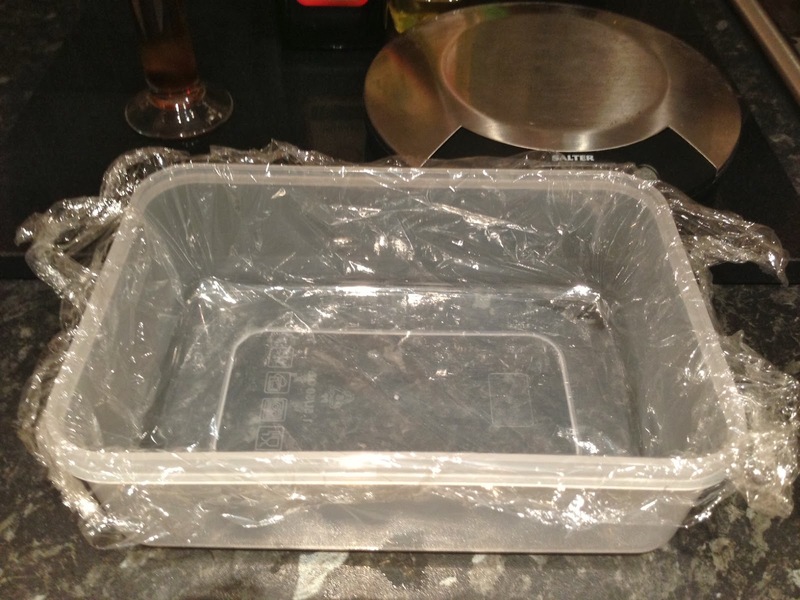 Line your soap mold with cling film to make removal much easier. 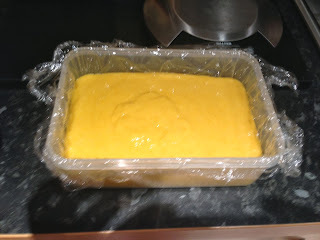 Then pour your soap into the mold, I used a cheap plastic box with a lid from the pound shop. 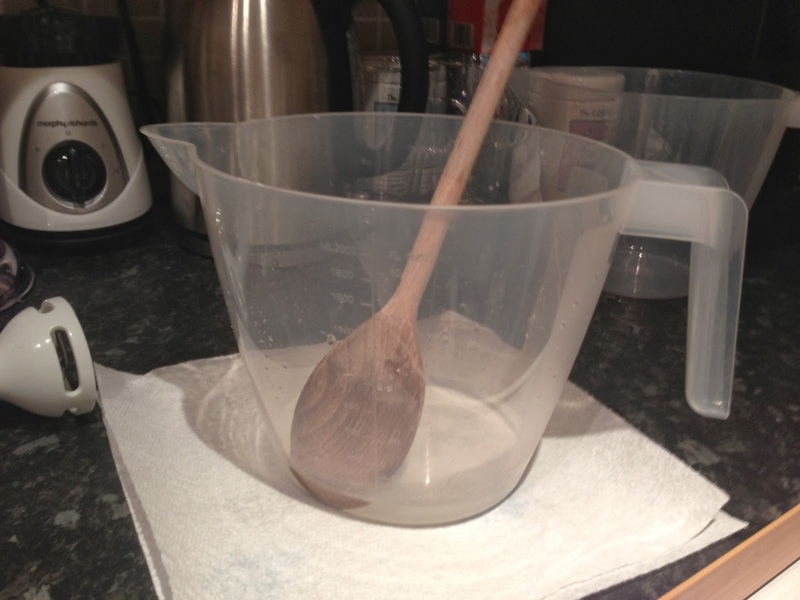 Cover the soap mix with another piece of cling film to prevent soda ash from appearing on the surface. I then put the box lid on to act as a safety measure and prevent spillages. Your soap mixture should be an opaque creamy yellow colour at this point. Normally you would insulate your soap to make sure the chemical reaction completes fully, but the sugars in the milk react and produce huge amounts of heat so insulation isn’t necessary. The soap will change to a dark orange colour and go translucent, this is called gel phase and shows that the reaction is occurring properly. Leave the soap in the mold for at least 15 hours to ensure the reaction is complete. The soap can then be removed from the mold and cut into bar sized slices. It should be pretty soft but firm enough to handle. If it is still too soft remove any surface coverings and leave to air dry for a bit and hopefully it will harden enough to remove and cut. The soap then needs to be left to air dry or cure for six weeks, during this time it will dry out and become a nice firm bar of soap. I leave mine in my spare bedroom as it is away from my pets and the environment is cool and dry, perfect conditions for curing soap. I will update this post after the soap has cured and let you know if I was successful in keeping the orange scent from disappearing.